The Philadelphia Stars had a 7-1 record in the inaugural United States Football League season and faced a rematch on April 30, 1983 with the one team that had beaten them thus far, the Tampa Bay Bandits. Coached by Jim Mora, the Stars featured a ball-control offense led by QB Chuck Fusina and star rookie RB Kelvin Bryant as well as a tough and opportunistic defense. They survived a close call against the Boston Breakers the previous week that provided them with a two-game cushion in the Atlantic Division. Tampa Bay had won its first four games before losing two of three and was at 6-2 and trying to hold off the Chicago Blitz in the Central Division. Under the guidance of Head Coach Steve Spurrier, the Bandits had a strong passing attack and while they had lost veteran QB John Reaves to a broken wrist, young backup QB Jimmy Jordan out of Florida State was performing well in his place. There were 41,559 fans in attendance at Tampa Stadium for the Saturday contest. The Stars set the tone on their first possession, driving 77 yards in 11 plays. RB Allen Harvin had a 10-yard carry and Kelvin Bryant ran the last 10 for a touchdown, with David Trout adding the extra point for the early 7-0 advantage. Still in the opening period, a fumble by Tampa Bay RB Sam Platt after a nine-yard gain on a reverse was recovered by SS Scott Woerner. Four plays later, the Stars added three points with a 44-yard Trout field goal. Early in the second quarter, the Bandits got on the board as the result of an eight-play, 52-yard series that featured a pass from Jimmy Jordan to WR Eric Truvillion for a 33-yard gain. It was Jordan to Truvillion again for a two-yard TD to finish the possession off and Zenon Andrusyshyn converted to make it a three-point game. The home team had an opportunity to tie the score with 1:28 remaining in the first half, but Andrusyshyn was wide to the left on a 37-yard field goal attempt. The Stars remained ahead by 10-7 at halftime. Philadelphia started off the third quarter with a methodical drive, mixing runs and passes. Facing second-and-ten at the Tampa Bay 20, Harvin took off on a sweep to the right for a touchdown. Trout added the point after and the visitors were now up by 17-7. The Bandits responded with a series that resulted in a 25-yard Andrusyshyn field goal to make it a seven-point contest. Tampa Bay had largely controlled Bryant in the first half, but on the ensuing Philadelphia possession the star rookie took charge as he broke away for a 22-yard carry to the Tampa Bay nine, gained six yards on the next play, and finished the drive with a three-yard touchdown run with 2:35 remaining in the third quarter. Trout again converted to extend the visitors’ lead to 14 points. The Bandits had opportunities in the fourth quarter, but failed to capitalize. A poor 27-yard punt by Philadelphia’s Sean Landeta from his own end zone gave Tampa Bay the ball at the Stars’ 39. But on a third down play, a Jordan pass was intercepted by CB Antonio Gibson to snuff out the threat. It proved to be all the Stars needed as they won convincingly by a final score of 24-10. Philadelphia had the edge in total yards (332 to 321), almost evenly split between rushing (175) and passing (157) yards, while the Bandits were held to 69 yards on the ground while gaining 252 through the air. The Stars also led in first downs (20 to 16) and time of possession (32:44 to 27:16). Tampa Bay accumulated six sacks, to just one by Philadelphia, but also turned the ball over four times, to two suffered by the visitors. Chuck Fusina completed 17 of 28 passes for 232 yards and gave up one interception. Kelvin Bryant rushed for 106 yards on 22 carries that included two touchdowns and also had four catches for 21 yards while Allen Harvin contributed 67 yards on 9 rushing attempts that also included a TD. WR Willie Collier led the Philadelphia receivers with five catches for 73 yards. For the Bandits, Jimmy Jordan was successful on 24 of 47 throws for 260 yards and a touchdown, but also was intercepted three times. Eric Truvillion and Sam Platt had seven catches apiece, for 81 and 56 yards, respectively, and Truvillion scored a TD while Platt also led the club in rushing with 46 yards on 10 attempts. The Stars continued to play well and cruised to a 15-3 record, reaching the USFL Championship game before falling to the Michigan Panthers. Tampa Bay won its next three games but collapsed down the stretch and ended up at 11-7, third in the Central Division and out of the playoffs. 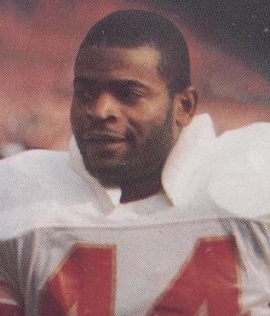 The win over the Bandits was the sixth hundred-yard rushing game for Kelvin Bryant, who led the USFL at that point with 929 yards, and in the end he was second to New Jersey’s Herschel Walker with 1442 yards, scoring 16 touchdowns along the way. He also caught 53 passes for another 410 yards and a score and received MVP honors from the league.